Congratulations to Jonetta, Jill, Erin, Bn100 and Jo-Anne, the winners in Loren's giveaway. Thank you to all who participated! I’m Loren Mathis and I’m a new romantic suspense author. I grew up in a rural town in eastern NC. I went to college at UNC. I am grateful that I’m now able to pursue my dream as a writer, and to share the characters who roam around my head with you. Swift Strike is the second novel in my “SEAL Team 14” series. It is a standalone novel so the first book does not have to be read in order to enjoy this installment. The SEAL Team 14 series focuses on an elite group of U.S. Navy SEALs. After she is rescued by Navy SEAL Jesse Denison, petroleum engineer, Lena Westlake, can’t get the handsome, brooding soldier out of her mind. Despite their intense attraction to one another, Lena doesn’t have a reason to believe that the two of them will meet again after her rescue. “Zaida ya kivuli,” the man barked out in a low, gritty voice. Jesse didn’t have a freaking clue what language the guy was speaking in. Jesse was fluent in Arabic, but the words falling out of the militant’s mouth were definitely not Arabic. A soft anguish-filled sob escaped Lena’s lips. Her eyes widened with fear, sweat rolling down the sides of her face. Then the militant moved his wrist. The movement was so slight as to be almost imperceptible, but he was ready for it. Jesse did not hesitate to pull the trigger. He took the head shot. The whole tragic ordeal was over in a matter of seconds. Slumping to the ground, the knife slipped from the man’s lifeless fingers. Jesse sprinted toward Lena who’d also collapsed to the floor in the aftermath of the shot. Dropping to his knees, he reached for her. His hands swiftly skimmed her face and neck to see if she’d somehow been injured in the shooting, checking for a heartbeat. His eyes closed in relief when he felt the persistent thudding of her pulse against his fingertips. Slipping a hand underneath her head, he touched her shortened locks. Those assholes had apparently chopped off her hair. Luckily, she hadn’t been harmed by his shot. She was drenched in the blood and brain matter of her captor, but she didn’t have any visible bullet wounds or lacerations. She still lay unresponsive, but she had probably fainted from the stress of the situation. Comment for your chance to win a free copy of my book! There will be 5 winners drawn! Giveaway ends 11:59pm EST Oct. 18th. Please supply your email in the post. You may use spaces or full text for security. (ex. jsmith at gmail dot com) If you do not wish to supply your email, or have trouble posting, please email maureen@JustRomanticSuspense.com with a subject title of JRS GIVEAWAY to be entered in the current giveaway. Great excerpt! Thanks for the post as I'm off to find the first book in the series. Thank you so much for your comment! I really hope that you enjoy my first novel, Pushed to the Edge, and good luck in the drawing! Sounds really good. Would love to win! Thank you for taking the time to comment, Debbie! Good luck in the drawing! Thank you for the comment! I definitely have a weakness for Alpha Males, so I love writing about SEALs. Good luck in the drawing! Thank you for taking the time to comment, Colleen! I'm so glad that you enjoyed the excerpt. Good luck in the drawing! Thank you so much for your comment. Military men are my favorite type of Alpha Males to write about. Every woman needs saving every now and again, and who better to come to the rescue than a man in uniform! Best of luck in the drawing! Thank you for taking the time to comment, Sherry! Best of luck in the drawing! The first book, Pushed To The Edge is available for the Nook. Will Swift Strike be available for the Nook at some point? Hi there, thank you so much for your comment! 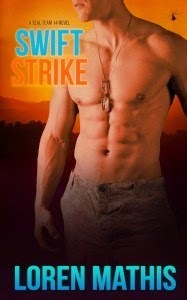 Swift Strike will be available for Nook, Kobo, and in the iBookstore in January. Best of luck in the drawing! This sounds fantastic. Looking forward to a great read. Thank you for the comment. I hope that you enjoy the read, and best of luck in the drawing! Awesome excerpt. This sounds like a great series! And that cover, wow! Thank you for taking the time to comment, Brooke! I'm so glad that you enjoyed the excerpt and cover :) Best of luck in the drawing! Thank you for your comment! I'm very glad that you enjoyed the excerpt. Best of luck in the drawing! Thank you for hosting me, Maureen! It's good to be back here on JustRomanticSuspense! Congrats to Loren on the new release! This looks and sounds exciting! Thanks for sharing! Thank you, Erin! Best of luck in the drawng! Thank you for your comment, Jill! I'm glad that you enjoyed the excerpt. Best of luck in the drawing! Sounds like a great book. Thanks for the giveaway. Thank you for your comment, Jaclyn! Best of luck in the giveaway!